The California Attorney General (Kamala Harris) released a Data Breach Report early in 2016 (Available Here) which details the scope and breadth of data breaches over the past four (4) years and provides guidance to a wide range of businesses explaining processes for securing data based upon the criticality of data handled by the business keyed to national standards. Businesses can use these processes and securitization protocols as a defense to third party and governmental allegations of data security negligence. Lately, the Federal Trade Commission (FTC) has been aggressively pursuing companies that do not handle data properly. See Federal Trade Commission v. Amazon.com, Inc., C134-1038-JCC (W.D. Wash. Apr. 26, 2016)(although court denied the FTC’s request for an injunction, the Agency did assert that Amazon failed to maintain reasonable and appropriate data security practices). The California Breach Report provides guidelines for security compliance. Data Types: Although the data breach laws vary State by State as do the definitions of what is “protected data,” the California Breach Report describes certain critical data types: (i) name, plus Social Security number, driver’s license number, financial account number (such as bank account numbers and payment card numbers), (ii) medical information, or health insurance information; and (iii) credentials for online accounts (user ID or email address, plus password or security question and answer). Notification requirements vary State to State. In California, companies must offer identify theft services to victims in certain breaches. As for timing, the average time to notification was 40 days, typically by mail. Recommendations for Reasonable Security: Establish a Standard of Care for Personal Information (Person Identifying Information or PII)? Best Advice: Limit PII and personal information collected and retained by the organization. If an organization does not have data, the data cannot be breached. This is the strongest protection. As breaches continue, the hacker tools increase in sophistication and stakes increase, organizations must be vigilant and proactive to ensure more effective protection of PII. Basic Privacy Practices: Limit PII collected and retained. Good privacy practices are reliant on a foundation of good security. An organization cannot protect people’s privacy without being able to secure their information from unauthorized access. Security is Challenging: Securing information in the online world is very challenging. The adversaries are sophisticated. External Hackers: Large criminal enterprises, including transnational organizations and even nation-states, are engaged in attacking our information assets and stealing data. Internal Hackers and Errors: The internal challenges are both technological and human. As organizational information assets and data become widely distributed, physically and per digital storage (such as cloud storage and processing and BYOD – Bring Your Own Device to work (hand-held phones and tablets for employees and vendors), exposure is exacerbated. Organizations amass huge quantities of information and retaining it for possible future use. Employees and vendors are sometimes careless in handling PII. Intentionally stealing information is oftentimes an opportunistic event. Security is a Responsibility: There is no perfect security, hence organizations have a responsibility to protect PII. Organizations have both an ethical and a legal obligation to protect PII from unauthorized access. Neglecting to secure systems and data opens a gateway for attackers. 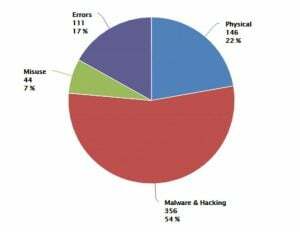 A Report by Verizon indicates that 99.9 percent of exploited vulnerabilities were compromised more than a year after data security controls for such vulnerability were publicly available. If an organization chooses to amass PII data but fails to uphold its security responsibilities, they may be culpable. In California, the Information Security Statute (California Civil Code§ 1798.81.5) requires a business that collects PII to use “reasonable security procedures and practices appropriate to the nature of the information, to protect the personal information from unauthorized access, destruction use, modification, or disclosure.” Federal laws and regulations include the Gramm Leach Bliley Act (GLBA)(financial services), Health Insurance Portability and Accountability Act (HIPM)(health care); the Federal Information Security Management Act (FISMA)(federal agencies); and the Federal Trade Commission (Start with Security: A Guide for Business). Security is a Process: Information security laws generally require a risk management approach. Organizations must develop, implement, monitor, and regularly update a comprehensive information security program. Risk management generally includes the same basic steps, starting with assigning responsibility for information security within the organization and follow-on actions. Security is Based on Standards: Risk management process only achieves reasonable security if the risks are identified and effective controls implemented. “Security standards define the scope of security controls, the criteria for evaluating their effectiveness, the techniques for ongoing assessment and monitoring, and the procedures for dealing with security failures.” Standards are updated periodically and are aligned on a basic security process and defensive controls. The is a summary of the CIS Controls, grouped by action. A complete list of CIS Controls is found in the Breach Report, Appendix A.